This week’s post in the 50 Marriage Mondays series is another case of verifying what a relative told me some years ago. 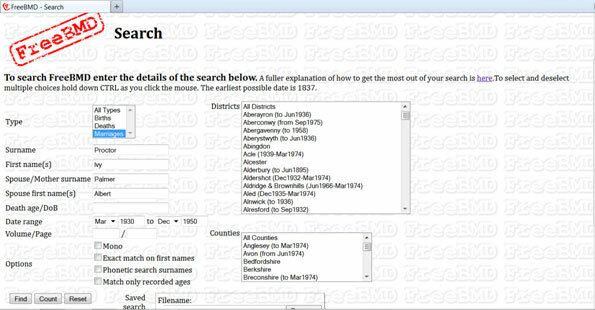 FreeBMD, which stands for Free Birth, Marriages and Deaths, provides an online searchable version of the General Register Office (GRO) Index of Civil Registration in England and Wales from 1837 to 1983. The ongoing project is run by volunteers and has now substantially completed transcription of the marriage index up to 1950. 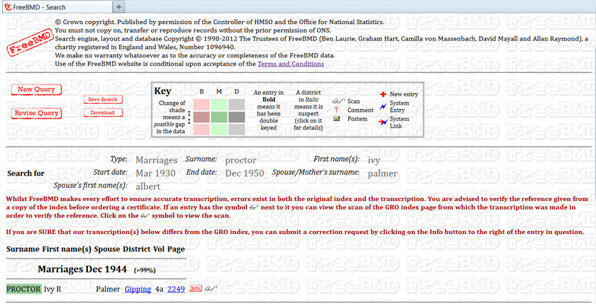 The search page provides a number of search parameters, but for this example I entered the couple’s names and a data range from 1930 to 1950. Strangely, my first search, where I entered the bride and groom the other way round, yielded no results. My second search gave one result. It is always worth tweaking search terms and trying again as mistyping search terms and index errors can cause a search to fail. In this case it turns out that in the entry for Albert Palmer, the spouse’s surname was transcribed as Procter because it is not clear on the original. Akenham, Ashbocking, Ashfield, Badley, Barham, Barking, Battisford, Baylham, Bramford, Claydon, Coddenham, Creeting St. Mary, Crowfield, Debenham, Earl Stonham, Flowton, Framsden, Gosbeck, Great Blakenham, Great Bricett, Helmingham, Hemingstone, Henley, Little Blakenham, Little Stonham, Mickfield, Needham Market, Nettlestead, Offton, Pettaugh, Ringshall, Somersham, Stonham Aspall, Whitton, Willisham, and Winston. Buxhall, Combs, Creeting St. Peter, Gipping, Great Finborough, Harleston, Haughley, Little Finborough, Old Newton with Dagworth, Onehouse, Shelland, Stowmarket, Stowupland, and Wetherden. Ivy Proctor’s birthplace, Hitcham, is not in this list. 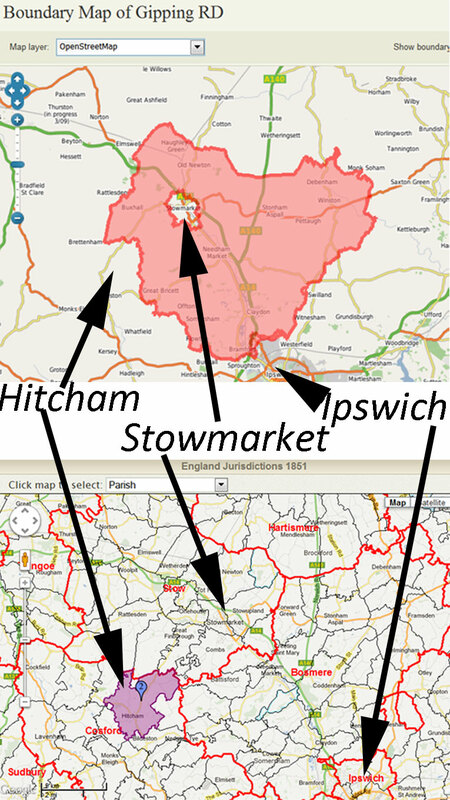 How far is Hitcham from Gipping district? A map is the ideal tool to visualise relative locations. Both these websites use Geographical Information Systems (GIS) technology to present maps of administrative units that existed in the past. FamilySearch’s England Jurisdictions 1851 is the more user-friendly implementation, but is limited by its focus on a particular time. A Vision of Britain is much more comprehensive and includes the history of a wide range of administrative units. As a product of a major academic project undertaken in the 1990s, the Great Britain Historical GIS, the website implementation is showing the age of its origin. The links to the boundary maps, and history of administrative units (important and useful to the genealogist) are not prominent. The boundary maps respond slowly, lack interactivity and support for pointing devices, and display only one administrative unit. Despite these limitations, it remains an invaluable tool. From England Jurisdictions 1851 we can see that Hitcham lies in Cosford district which adjoined Bosmere and Stow. From A Vision of Britain, we can see which parts of Bosmere and Stow became Gipping district.